Combine 1 package raspberries, sugar, and juice in a small saucepan over medium-high heat; bring to a boil. Reduce heat, and simmer 8 minutes, stirring occasionally to break up berries. Place raspberry mixture and remaining package raspberries in a medium bowl; cool 5 minutes in freezer. Place 2 tablespoons yogurt in each of 4 glasses. 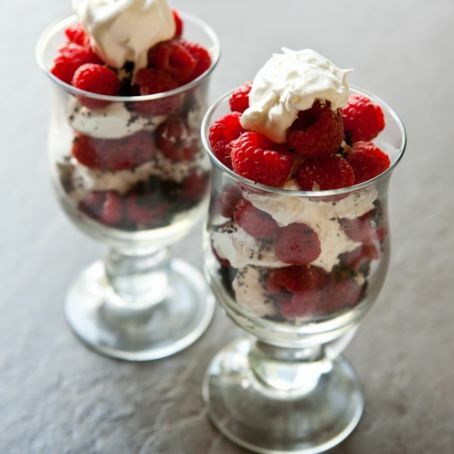 Top each serving with 3 tablespoons raspberry mixture and 1 1/2 teaspoons chocolate shavings. Repeat procedure with remaining 1/2 cup yogurt, 3/4 cup raspberry mixture, and 2 tablespoons chocolate.